Visitation preceding the service from 4-7 P.M.
Refreshments, following the service, at the funeral chapel. 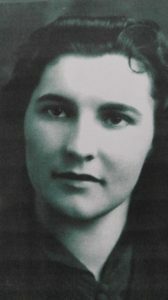 Gwen E. Welch was born near Stanton, Nebraska on October 10, 1920, to Jesse and Antonio(Spulak) Miller. She attended area schools and attained a GED later in life. On July 29, 1941, she married Russell E. Welch in San Francisco, California. Following Russell’s discharge from the Navy, they lived in Seminoe, Wyoming and Estes Park and Loveland, Colorado where Gwen ran a pre-school. She was the director of Head Start one of the first head start programs in Colorado. In 1973 they moved to Howells and she founded and directed the Howells pre-school. She also served as a trustee of the Library and Museum. She and Russell managed a cow/calf operation and they were also partners in Blum’s Bar for three years. Gwen established the Prairie Wind Wildlife Sanctuary in Howells and the family is very appreciative of the care and help that Lynn and Jean Blum provided to Gwen in her daily life and maintaining the wildlife sanctuary. Gwen is survived by a daughter, Kathleen Sauer of Troy, Alabama, three sons; Russell(Beverly) Welch of Howells, Daniel(Joan) Welch of Lawrence, Kansas and Dale(Christa) Monti, of Bennington, Nebraska, 9 grandchildren; Martin(Debbie) Welch, Jesse(Renee) Welch, Samual(Julie) Sauer, Kelly Sauer, Matthew(Kim) Sauer, Jennifer Welch and Jon Bernson, Nathan(Chandree) Welch, Rebecca Welch-Weigel(Colin) and Jonathan(Ayja) Welch, 15 great-grandchildren; Jimmy, Nicole, Zoe, Matthew David, Emily, Megan, Tyler, Kayli, Miles,Jane, Weston, Beatrix, Cecily, Jonah, Isami, Jake and Kyle and many dear nieces and nephews. She was preceded in death by her parents, husband, great-granddaughter Adelaide Welch, twin brothers in infancy and three sisters; Ena Litty, Lenis Blum and Lela Spreen.